The cool folks at KERRANG hit me up to do their cover and interior artwork to celebrate Gerard Way (of My Chemical Romance) and his new series on Netflix "THE UMBRELLA ACADEMY". I was stoked and couldn't say no to such a cool opportunity. By chance this is the 4th project I've done associated with Gerard Way. Totally weird to type that last sentence. I'm stoked that I've been an artist this long. Why haven't any pianos fallen on me yet (...knock on wood)? I ended up doing 3 illustrations for the project. They requested that I draw Gerard from the "Revenge…" album era of his life. Since it's a weekly magazine the deadline was INSANE! I had a little over a week to turn in sketches, get approval and then turn in finished pieces. Normally it takes me a week to design and illustrate a poster. 1 poster! One!! That's how my brain and hands work. Somehow I was able to cram 3 illustrations into 1 week. My brain STILL hurts but I'm very proud of completing the project and the final results. Trying to get the vibe of the cover and be on the same page as my art director and editor took me a few tries. They were really patient with me and let me find my groove. Sometimes it takes more than 1 try. Sometimes it takes 13 tries. After the last try the art director and editor were happy and I got to finish the piece. Normally I would’ve turned in sketches for all of the illustrations at the same time but there wasn’t much time and I really wanted to get as close to a likeness of Gerard as time would allow me. Again I only had a few days. So I turned in sketches for the other 2 illos once the cover was finished. I’m sure now I could draw him in my sleep. I inked these as I normally do but then finished everything in Photoshop! In the 17 (or is it 16 or is it 13) years I've been a full time freelance artist I've done all my color and design work in Illustrator. I wanted to try something new for this. My brain is still angry with me but… as I said I'm REALLY HAPPY with the final pieces. For the “Umbrella” piece the art director had sent over an idea of Gerard holding an umbrella. I liked the idea and just put my own spin on it. I always wanted to draw someone holding an umbrella as skulls rained down on them. I was really enjoying Photoshop with this piece. Again, I normally used the program to make jpgs. It took some courage (aka stupidity) to try it on a freelance project instead of waiting to do a personal piece. Which I never have time for. The “Typewriter” piece was also fun to do but I was freaking out at this point. 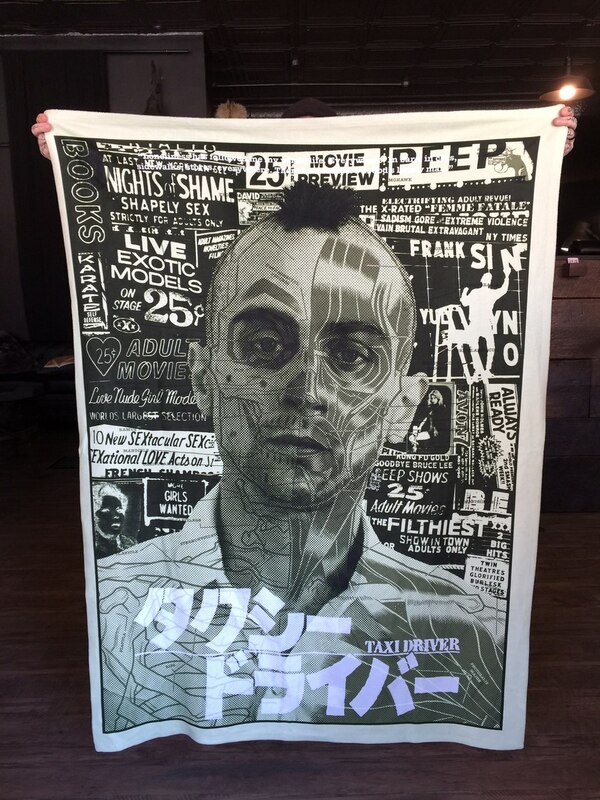 The art director referenced the Nick Cave poster I had designed and wanted basically that. Easy. But I didn’t make it easy. ( I never do…) I knew that he didn’t want me to replace Nick’s head with Gerard’s and call it day. So I had to come up with another way of drawing something I had already done without copying myself. So I threw everything in there. Hence the Easter Eggs. The only similarity is that I wanted to draw Gerard typing as if he were playing the piano. Same as what I did for the Nick Cave poster. Plus they’re both wearing suits. 1. I hid the Umbrella Academy logo on the cover. 2. The typewriter is an Adler Universal 39. Same machine that Jack Torrance uses in the movie “The Shining”. 3. The Umbrella Academy logo takes place of the Adler logo for the typewriter. Plus I “hid” my “signature” signature on the other side. I think it’s egg-worthy. 4. Number 6 is the dead brother from the show. He’s dead the whole time so I didn’t spoil anything. I told the art director it was Vanya’s number because I only had a Netflix ad to go off and I was trying to do 3 weeks of work in 1 week! One week!!! I read the graphic novel years ago and just went with it cuz I knew how it ended. I hadn’t seen the show while I was working on these. After turning in the job a few days later the show premiered. 5 minutes in and I thought “I totally messed up!” But then #6 ends up being dead the whole time. So that totally works. Take that dementia! 5. That’s Vanya’s violin on the wall. 6. I “hid” 3 books on Gerard’s desk. ALL published by Dark Horse! Pretty sneaky I know. • “The Umbrella Academy” (obviously). • “The True Lives Of The Fabulous Killjoys” (sorta obvious). I did one of the covers for that mini series and also an art print that you should pick up nudgenudgewinkwink! 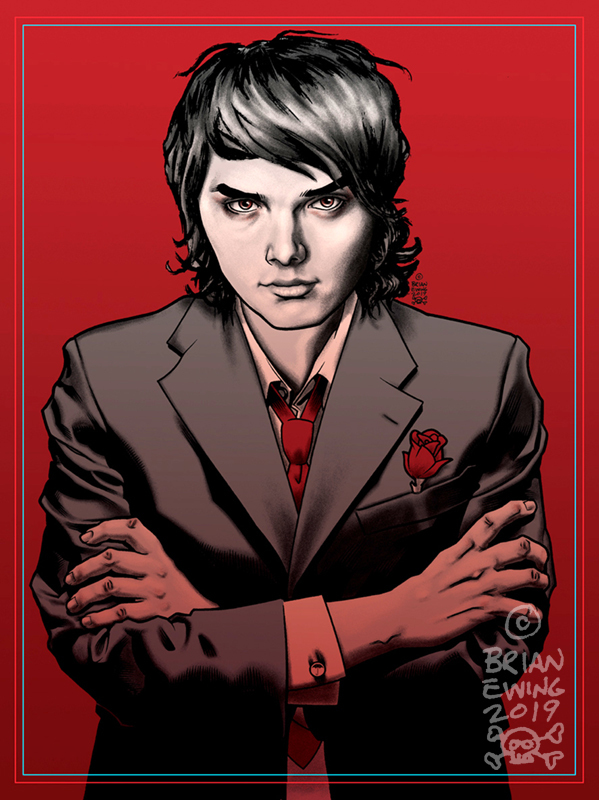 Gerard Way wrote the book and Becky Cloonan (the coolest person alive) drew it. • ”Don’t Hold Your Breath” (not obvious). In 2010 Dark Horse published a book on me and my artwork. I recently heard it was soon to be on permanent display in the Smithsonian. It’s true! And dogs can’t look up! I’m sure it’s in the bargain bin. 7. Alexisonfire has a new album coming out. They should hire me! 9. To date this is the fourth project I’ve done involving this dude aka Gerard Way. If anyone can name all 4… I will hook you up with a bunch of cool crap. Email me. If you physically own all 4 I will give you a free drawing! Luckily I don’t hafta disqualify my family. They have no idea what I do for a living. You can pick up the magazine at your local newsstand or get it online here. If they send me any copies I'll post them to my shop. Since some of you kids are too cool for Facebook I’m posting here. Plus I didn’t feel like sifting through all my “friends” trying to find yo asses. It's MY BIRTHDAY so buy me a drink and abuse the photobooth*! Gifts aren't required, unless its money! You have Sunday to be hung over!. *Bring CASH for the photobooth! It’s the ONLY bar in Columbus with a photobooth!!! Here's what last year looked like! I’m finally getting back to life after taking a much needed break from email, social media, my phone and work. If I haven’t emailed you - expect something soon. Same goes for text messages and hang outs. THANKS for understanding!!! Just wanted to take a minute and thank EVERYONE for their love and support throughout the past year. If 2018 were my favorite record store then… to misquote Atmosphere - “I've gotten love, I've gotten drunk, I've gotten beat up in that parking lot”. Meaning I learned a TON this past year. I’m thankful for my amazing partner Andria and my amazing friends. People who love me and let me love them back. I’m just as thankful for all the “beatings” the year has handed out to me. I spent half of my professional year with freelancing on a ton of projects and the other half as a tattoo apprentice at Cauldron Tattoo under the mentorship of Mike Moses. • The print I originally designed as a wedding invite/gift for my friends Travis and Jenny (The KISS) ended up on the walls of the Columbus Museum of Art. • I got to work with Megadeth! 13 year old me is still in shock. Same goes for the PIXIES, DIRTY HEADS, Lagunitas Beer and SOCIAL DISTORTION! 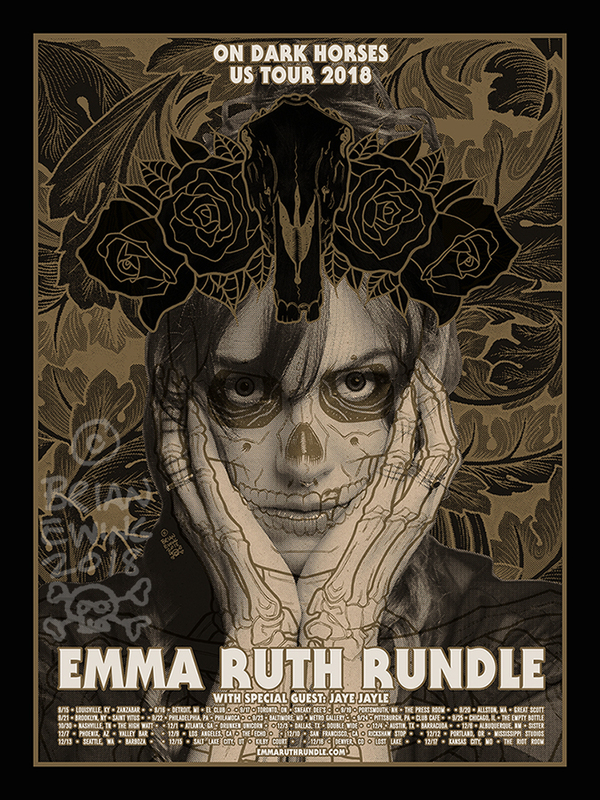 • Emma Ruth Rundle - check her out! Working with her and Jaye Jayle was a great experience. Very proud of the poster! • My computer died a slow painful death! Woohoo! • We (Andria and I) moved to a bigger (yet still affordable) house in Columbus. The owners claim that our place was built in the late 1800’s and used to be a brothel! Sadly, no ghosts. Thankfully I had GOOD friends to help us move all of my crap! Thanks David, Jason, Ashley, Jason, Andrew and the moving guy who acted like Marky Mark circa Funky Bunch era. Keep that dream alive homie. • I was fortunate enough to see a TON of bands! Some clients - some not (yet). • We traveled a ton to exhibit at Five Points Fest, Life is Beautiful, New York Comic Con and DesignerCon. SO much FUN and good times with friends and sharing my work with new people. Plus we stickered a lot! We WILL be back for 2019!!! 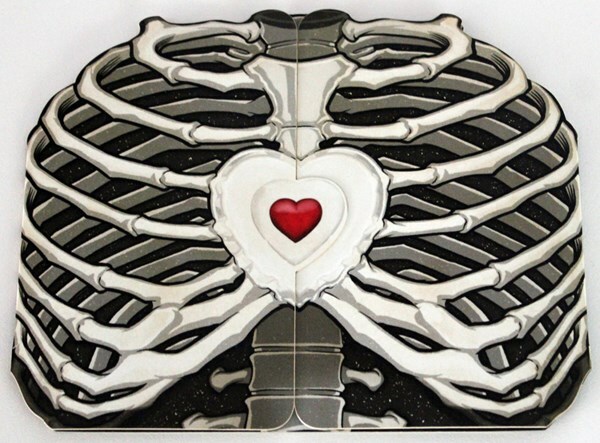 • Some of my work was used as HUGE window displays in Chicago for Art Gives Me Hope! • I got to collaborate with the lovely folks at YESTERDAYS on some new pins! 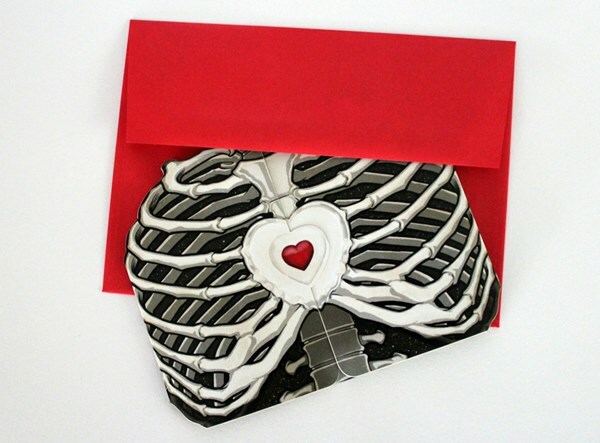 • Justin and I celebrated our 6th year of us operating as METACRYPT with our 18th release of our baby boo SHUB ZEROTH. Hope you’re as stoked as we are and follow us into our 7th year! • TATTOOING! I made the conscious effort to buckle down to focus on my apprenticeship and it is paying off. I overcame a few hurdles of confidence, line quality, composition and color this year. THANKS to all of my clients who took a chance and let me tattoo them. Especially the people who walked in as strangers and left as friends. THANK YOU Rebecca, Jim, Vanessa, Louie, German, Jason, Kelly Oooo, Eldon and everyone else! THANK YOU! • CAULDRON TATTOO. BIG THANKS to my mentor -Mike Moses for putting up with someone as pretty as me and teaching me how to tattoo. Greg Lahm for sharing his secret knowledge of tattoo history and helping me realize that not any person can walk into a shop and learn to tattoo - you have to be invited. 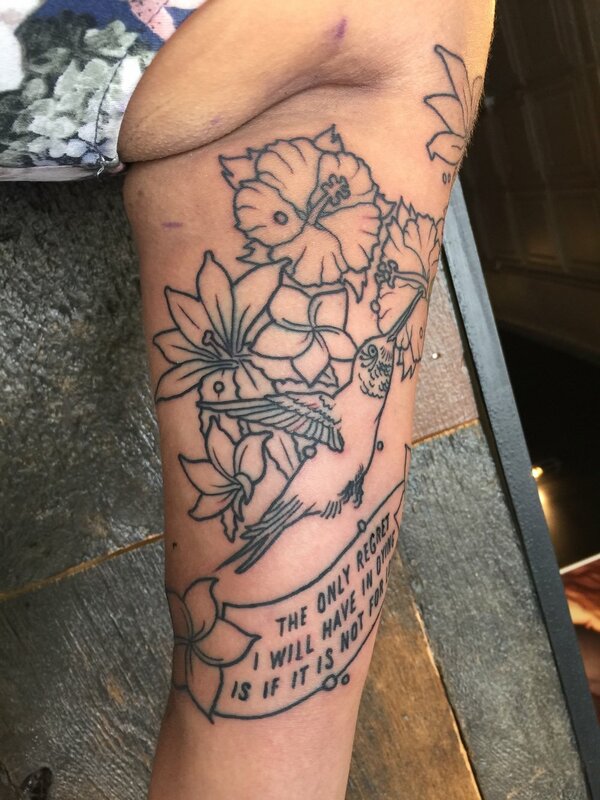 Emmanuel Mendoza for joining the shop and providing all of us with a unique perspective and style on life and art. C(K)ris Kirkpatrick for keeping us all in line. • YOUS GUYS! No point in writing any of this if it weren’t for the folks that found value in my work and felt it was worth peeling off a few greenbacks to be a part of what I’m trying to do. Stick around cuz 2019 will be rad!